Eusko Etxea of ​​Sao Paulo, and in its name José Antonio Álava Ugarte, regret to communicate that the dedicated partner no. 175 of Eusko Alkartasuna of São Paulo, Gentil Giménez, passed away the 24th of March.. Gentil Giménez was 68 years old and in 2017 he had been diagnosed with ALS (amyotrophic lateral sclerosis). 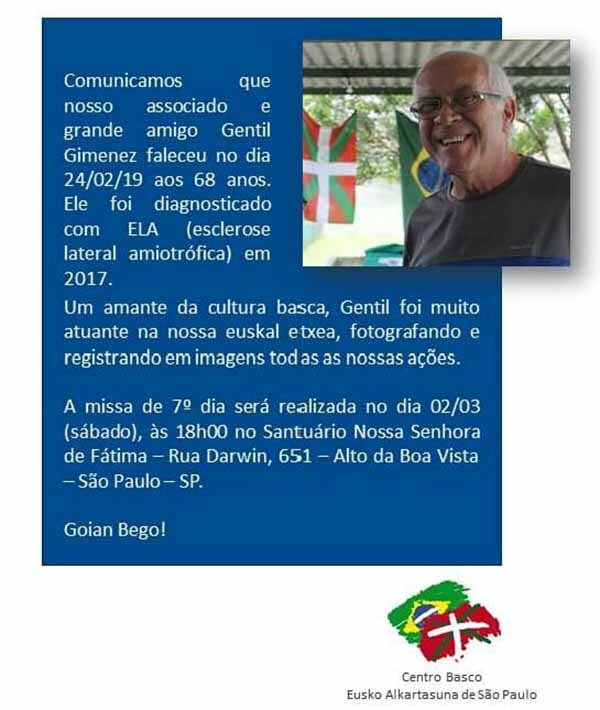 A true lover of the Basque culture, Gentil was a very active person in the heart of Eusko Alkartasuna in Sao Paulo, photographing and recording all the activities of the center in images. A Mass in his memory will take place on Saturday, March 2, 2019 at 6:00 p.m. in the Church of Our Lady of Fatima (Rua Darwin, 651, Alto da Boa Vista).